More soon, i'm transcribing as fast as i can. The show was fantastic of course. KODO never disappoints. I'd have to say my favorite piece was Monochrome, mostly because I can appreciate the high level of technical difficulty in the piece. The dynamics of the piece were awesome. Yes, I'd also have to say Hana Hachijo was a close second. I just like watching Chieko play the odaiko cause she's so smooth and fluid in her motions. Cool piece. ---leigh momii / kaze daiko, seattle. The 2/3 of HANAYUI dropped in for a weekend of fab workshops for the public and the taiko groups here... if you ever get the chance to take a workshop either the movement or the voice, get to it. WOW is all i can say...it was spiritually a magical 2 days!
" STAN ? " ---the others in the gallery snicker..I wish i had THAT on video, as it was a funny moment. Self and Others: Akio Takamori @ Grover Thurston Gallery, Seattle. when i see akio takamori's ceramic self portrait heads on other body-forms (the sphinx, griffins embracing, baby crawling, daibutsu, doggies) you can imagine what this artist is daydreaming about. at the opening i asked him if the heads are attached to the bodies, and he goes over and pulls the head off and shows me that they are separate vessels. when he camly puts the head back, its so funny to see him do it so gently and nonchalantly, while everyone else is treating them so delicately. they are far from delicate, they are a GAS to see when walking thru Occidental Square on the way to a Mariners game-- i watched the teeming hordes walk and gawk. Too Funny. at other times when i visit the gallery and stand really close to the heads and look from each side, i can see how the 'Self and Others' interact with each other, their gaze is deliberate and smirky. There's even a few that wink! ---ihk. The Notorious C.H.O.- dropped into Seattle November 11, 2001 for the filming of her 2 shows at the Paramount Theater. The Undisputed Diva of Comedy was absolutely amazing, her comical renditions of people, body language, funny faces and eyeball gymnastics, the only asian american female performer i know of that's not afraid of saying the word F*CK..Loudly & Proudly..( well, there's one more..Christine Choy ).hey i'd type it here, but i know that someone out there will report me to the tripod decency webpolice and my site will be gone in a blink of an eyelid! "yeah, baby! ", "u go girl! "..was a commonly spewed kiai at the performance. Not only did i anxiously await the arrival of The Notorious, but for a long time, it has been one of my new year's resolutions and ultimate dream... to photograph the most vibrant, inyour face comedy diva in the world! Yes, the Fabulous Margaret Cho!!!! I was the "Behind the Scenes Photographer" for the film, there was so much going on my brain was all over the place! The coolest part of the experience, being a gear in the well oiled machine of the production team of this concert film. The absolute best part was the moment that i got to photograph MC in the dressing room. The room with the expansive mirror with bulb lights sectioning off each part of the mirror from end to end. In the middle section of the mirrored side was the chair, with none other than the Fab Ms Cho sitting there with tousled hair waiting for the makeup specialist to do her thang. I entered, Karen MC's mgr was sitting on the counter to my left, MC dead ahead with makeup chick, infront of me- the camera chick with the smooth moves, the smoothest body pan around, shooting my style, with both eyes open. It was so quiet that my camera shutter seemed thunderous. A few shots into it, and i had to step outside to grab my camera bag, to rotate the lenses and make sure i got enuff shots. MC is had great face to shoot, smooth with great shape. Many of my friends joke about their large asian gourds ( head size ) and gave me the assignment to figure out if MC's head was as big as she once joked about. Visualizing SY's head next to mine, i was constantly trying to superimpose the hologram in my head over that of the Fab MC's--all while i was shooting, and trying not to smirk. I don't really know what my face was doing since i was still in awe of my situation. It reminded me of the time i was in the dressing room of the Grand Kabuki Theater's star onnagata's getting into his 'zone' for the application of the white makeup--that was really stressfull because i couldn't get eye contact..forbidden. Did i have eye contact with the Fab MC? i can't recall, i was trying to fully concentrate on the moment to capture. **Paparrazi Moment: When the Fab MC, was lead out of Make-up and herded into the elevator to get to the stage, THAT was the defining "paparrazi moment" -- why? becuz of all the media equip'd peeps that followed her into the elevator all the cameras pointing in her direction..a little intimidating..all the peeps in black with boom mikes, lenses, things in her face..like moth to a flame. I stood as far back as i could to get all the gear in the shot, media frenzy! So, SY..i think that your cranium is way biggah! TEAM CHO rock on! Amagatsu Ushio, Sankai Juku's founder and artistic director tells us that Butoh expresses the language of the body rather than a theoretical meaning of movement. This time Sankai Juku gives us " YURAGI In A Space of Perpetual Motion " with a soundscape of music by Yaz-Kaz and Yoichiro Yoshikawa. Dancers: Amagatsu Ushio, Semimaru, Ogata Atsushi, Iwashita Toru, Takeuchi Sho. One act in 7 sections. To me, it seemed like a recurring dream, reruns of portions of all the other Sankai Juku works that I have experienced before. Jomon Sho, Kinkan Shonen, and Unetsu all spliced together and shaken up, there were no smooth transitions from one slice to the next. Group and solo alternating was the schematic pattern. Amagatsu stands out clearly as their leader. The last section was the most intriguing for me, it contained many visual elements that kept my attention. The other stuff was so bland that I can describe it as one phrase of blissful state of wondering. In other words I paid thirty bucks for an aural and visual LULLABY??? I like to say LULLaBYE cuz I was getting soooooo sleepy ( I yawned 24 times) ! The set was interesting tho I often drifted to the state of wondering if the Animal Rights people were going to storm the joint for cruetly of slowly roasting a rabbit in a public performance! The set has these "torchiere" halogen-style lamp housing that they had placed the live rabbits inif they were recalled for unsafe in the homes, then geex what the hell was gonna happen here?? Were the rabbits sedated? They didn't move around much, if that were me, I'd be trying to jump over the side. I couldn't concentrate on the dance part anymore, my only brain energy was going to thinkin' about the rabbits..Jump, Jump- was what I was sending via mental telepathy..maybe these were special rabbits, bred to sit on scientific hotplates? Or maybe they were given lobotomies? Maybe the UW animal testing dept gave them the experimental rabbits to use?? I WAS NOT IMPRESSED ONE BIT. Sankai Juku has evolved all that it can, maybe devolve is the next plateau. Why can't we ever get to see Shijima?? Is it because it involves hanging from ropes? New rules for american born japanese: Amagatsu said to me " No Interviews with Photos and " No Interviews to Non Japanese" but the mainstream papers were allowed to take all the photos and get the interviews, white people. He considered me as non japanese. They'r starting to cater to Japan-o-philes! U dont diss your people. Just in time to follow the Peace Rallies and Anti-WAR demonstrations..for the next 6 days. the worst was the mar 23rd sunday the police were OUT of line messing with old asian women out shopping and a black family held in the middle of a street for too long..there were at least 300 cops in the pioneer square area. for NOTHING NO ONE WAS VIOLENT. dont believe the mainstream media, TV coverage is not telling the TRUTH, people are getting killed, this is NOT a clean war.. the USA is clearly the enemy.. our President doesnt listen to the PEOPLE.. we are against this war on humanity. History is repeating itself again. Talkin' bout racist hysteria --Did U see the poster that the Seattle Central Community College had up all over town?? the racist " J*P / Ch*nK " face on yellow paper? the director says its justified imagery.. but did they have a Japanese American Advisory Committee on their production???NO! 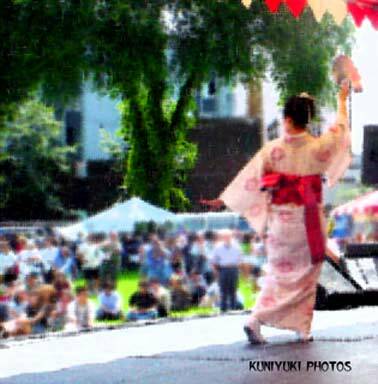 Aug 3rd, '02 : went to vancouver bc for the annual Powell Street Festival, a very COOL Japanese Canadian cultural/arts fest, which compared to Asian & JA stuff here, is very LEFT of center! Entertainment by locals include: Jay Hirabayashi's Post Butoh in the park, taiko & piano duet of Kage and Nishihara, Xperimental video, Draggin' Angels dragshow, buyo, martial arts, crafts, literary salons. Much more to offer than anything here, 'cept maybe our Bon Odori. writer-types cheesin' it up for the camera! In October of 1993, I requested a photo session with the "father of Butoh" , Ohno Kazuo. The host of the show was On The Boards, the same which brought SankaiJuku to Seattle. Artistic director Mark Murphy asked Ohno Sensei if i could photograph him in rehearsal. I waited in the lobby with all my camera gear , ( its that whole Japanese ritual of waitingif you wait long enough without showing irritation, they allow your presence)....waited at least 2 1/2 hours before the Masters presence blew past me. He stopped in front of me and gave a partial bow and continued down the walkway to the stage. I went into to the theater, was introduced to Ohno Sensei , his wife and son Yoshito ( also a dancer). I was told that I could photograph after the first run-thru. It was at that time they turned down the house lights and it was very dim. I was prepared for anything, especially the dark. I used Ilford 400 speed film pushed to 1600, Kodak Infrared and some Konica 3200 color film. the cameras I used were a combination of a Pentax ME/50mm lens, Nikon8008/Sigma35-135zoom. Ohno continually spoke of the respect he has for his mother and how that " being in her womb and the moment of birth" influences his daily life and existence within the Universe, as something very eternal. He also said he is a devout Christian, and I remember hearing Ave Maria many times. His spirituality was infinite, as in a Japanese Shinto sensibility, yet as religious as a devotee of Christ. An interesting combination, that only a Japanese could put into perspective, and not Other anyone. now able to present them the way i had envisioned them to be when i was shooting them. I call this particular set of photos " INFINITY, from Heaven to Earth"
eventually I would like to print them big, maybe lifesize. Copyright © i. h. kuniyuki, 2002. April 19-7pm/April 20-8pm::-NO ISMs Event @ The ParadoxTheater, 5510 University Wy NE (on the 'Ave) in Seattle's UDist. A VERY cool presentation of art, music, word and performances.a mixture of styles and forms.//NO ISMs 2001.is/:AN EVENT CREATED FOR/TO RUPTURE PHYSICAL AND MENTAL BOUNDARIES AND BORDERS WITH THE INTENT OF CREATIN' NEW FORMS OF PERFORMANCE AND ACTION THRU COLLABORATION. Featuring Seattle's Balcony,AsahiDaiko,Chiyo,Specs,King Otto,Michael White, Sam Mickens from The Sweet Science and Vancouer BC's LOUD. -SHAKE, RATTLE & ROLL: Seattle Style! I thought it was the end of the world,at least i would die surrounded by fab art (mine and a friend's). I guess i should have paid more attention to the "earthQuake headaches i'd been having since feb 2nd, culminating with the most incredible stabbing pain in my head 8 days and counting right up to the 6.8 Shaker! Still kind of paranoid when i feel the ground quiver, there have been many small vibrations since. I really don't want to be in the darkroom printing when the next EQ rolls in with the tsunami wave on its heels. Do u have your EQ kit ready ? 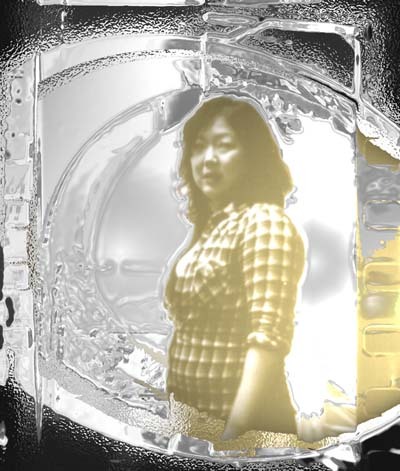 (jimmy clarke, yunie kim) at the darkroom! 07/00: the first day of BonOdori the clouds ripped open and let out 90minutes of monsoon-style rain right after TSUNAMI taiko played! Taiko is supposed to summon the gods to bring rain to the crops...well, it sure did work! i didn't have my camera, cuz the last time the air felt like this, the negative charge zapped my video. didn't want to take chances--so the only record i have of this weird summer occurrence is my vivid memories. 06:2:00- met with Philip Kan Gotanda, before seeing "Life Tastes Good", heard terrrible things about it..from other filmmakers [ u know who u are ] can't people just watch the film without deconstructing everything? In other words, I LIKED IT, it was fun!